Mix together milk, eggs, flour, and salt in a bowl. Add butter to dutch oven and let melt. 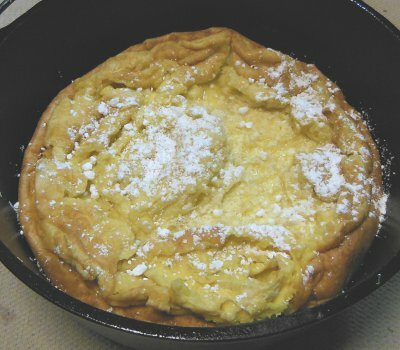 Pour batter into dutch oven and Bake for 25-30 minutes until pancake is fluffy and light brown. Sprinkle powdered sugar over pancake, cut, and serve. Let me know how you enjoyed your German Pancakes! Hey Dude,your replies are awsome.as soon as I can get to town I'll buy a camera send pics.thanks again.